Once the bride chooses her gown and begins choosing certain décor elements for the ceremony, the next monumental order of business is to choose the perfect bridesmaid dresses. Aside from the shape and style of the dresses, there are many other important elements that need to be considered when choosing these essential wardrobe pieces. The color is especially important because it needs to coordinate with the bride’s gown as well as the color scheme of the ceremony. Read on for some important bridesmaid dress style tips and find out how to properly coordinate with the bridal gown. Choosing the fabric for your bridesmaids’ dresses is just as important as choosing the color when it comes to coordinating looks. Ideally, you should have all or a large portion of your bridesmaids’ dresses made up of the same fabric you chose for your own gown. Whether it’s lace, chiffon, tulle or satin, nothing says cohesion like making all of the dresses with the same fabrics. If you don’t want to have the entire dress made of the same fabric as your gown, at least incorporate the fabric into a large portion of the dress so that it looks cohesive. There are so many elements to consider when choosing the color for your bridesmaids’ dresses. In addition to your gown, you have to take into consideration the season, the color scheme of the ceremony, the theme of the ceremony and even the skin tone of your bridesmaids. While some brides may want to get the gown and bridesmaids’ dresses made in the same color, the most elegant rule is to get them in a different color that either coordinates directly or contrasts in a perfect way. If your wedding is on the beach, for example, consider pale, natural or muted tones like peach or pink blush for the bridesmaids. 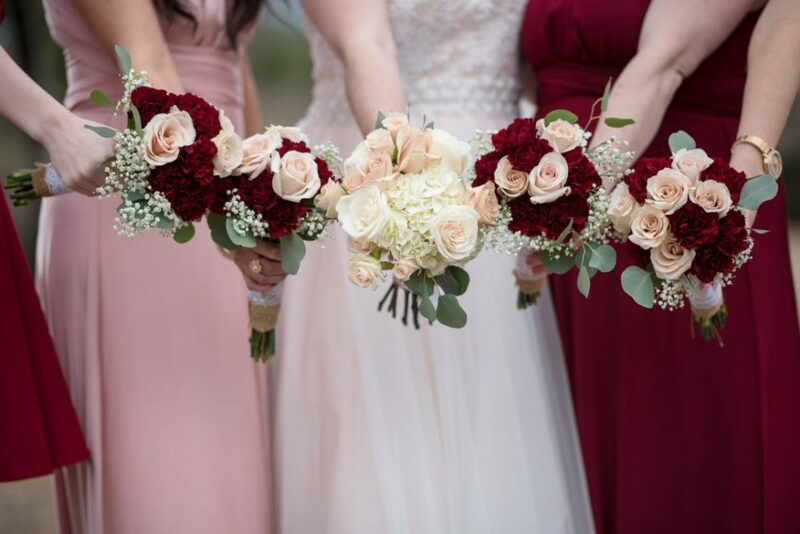 On the other hand, if your gown is fun and you want to add a pop of color to the bridal party, go for bold shades of red or rich shades like navy and plum. For a formal aesthetic, consider gray, silver or gold bridesmaid dresses to turn up the elegance and sophistication. Using accents and accessories is a great way to put a unifying finishing touch on each look. Matching clutches, shoes and accessories like pearl necklaces can tie the looks together perfectly. You can also opt for matching headpieces like floral crowns with matching flowers, embellished barrettes of the same variety, or even use something like a fancy tiara. While some brides want to make all their own decisions, it can be helpful to get your bridesmaids involved in the process of choosing their dresses. You may want to get their input on everything from color to fabric choices, or you may want to choose all the details and have them pick their own styles. Whatever the case, being open and making sure everyone is on the same page will help your bridesmaids stay coordinated and feeling comfortable on the big day. Every young girl loves dressing up. Most girls adore to go into mom’s closet and try on her skirts, dresses and high-heeled shoes. 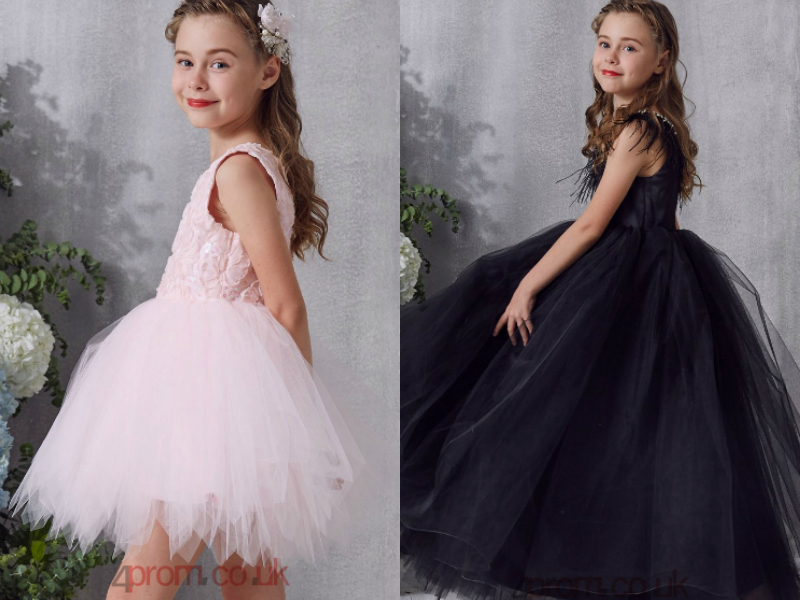 There are some lovely choices for dresses that are ideal for girls to wear for weddings, graduations, communions and family gatherings. 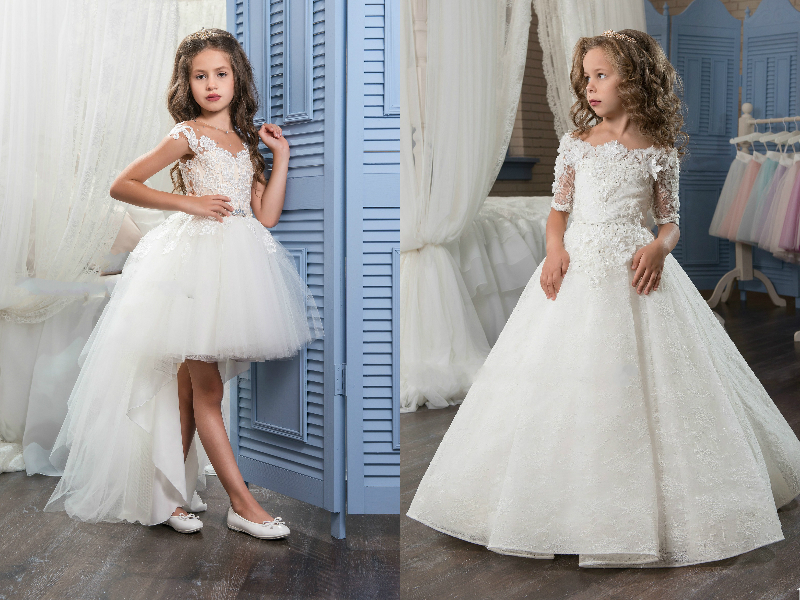 If the young girl in your life has been asked to be a flower girl in an upcoming wedding, you want to be sure that the dress she wears is not only pretty and appropriate for the occasion but that it is comfortable for her to wear all day as well. This is the crucial factor and you have to select the appropriate style suited for kids. You have to understand that it is not like the regular prom events conducted in colleges and you have to focus on kid’s garments that suit the occasion in the best possible manner. You will often notice that there are more options available for girl’s prom dress in the market. This is a tricky situation as having more options can confuse you about choosing the best style. In recent years, the prom dress for girls are closely resembling adult’s style. Remember that the objective of the event is to make them look cute and not like older girls. Avoid certain styles that given them a matured look and stick to the ones that project their innocence and cuteness. All said and done, they are still kids and they may not have the patience to carry on the dress for a long duration. In this regard, you are better off choosing a comfortable design than the very exotic ones that make them feel uncomfortable in short time. Avoid ones that have too many straps as they can be difficult to manage. You have to also take into consideration that they will keep playing and moving around with the prom dress and they need to feel comfortable with all these activities. If you notice that the school has a theme set for the occasion, you can go with the flow and select the appropriate dress. Many schools include prize giving activities for various tasks during this event and you can select the appropriate dress for your children that suits the occasion. Children usually like bold colors and you can experiment with them. You need not hesitate to try out those bold colors as it looks good on kids and you should consider them while choosing prom dress for your children. Always try the dress before the event and see if you need to do any alterations to get the best fit. In this way, you will not face any issues on that special day. It is very important to take your child along with you when you shop for the prom dress. After all it is their special occasion and they have every right to choose the best colors of their choice. If they happen to like a certain color that is not your favorite, you should still give importance to their choice as they will be happy to wear their favorite colors. When it comes to kids prom dresses, accessories play an important role in enhancing the overall outlook of the dress. In this regard, you should include these special accessories along with the dress. Girls always love colorful shoes and you choose them instead of other options. The only thing you have to make sure is to avoid the heeled shoes as this can be very uncomfortable for them to move around the whole day at the event. Make sure that the shoes are comfortable and the color matches with the dress in the perfect manner. Once you have selected the dress, it becomes easy to match the gloves with them. This can highlight the entire costume and give it a unique appeal. You have to ensure that you choose comfortable materials like satin for the gloves as they will fit perfectly and stay in place for a long time. Avoid choosing light colors as they can get dirty in quick time and children touch all sorts of things at the events. This is the latest trend with girl’s prom dress and you can select a matching bag for the event. This should not be too heavy and you can just go with a fancy design that looks small and appropriate for the size of the garment. In the same way, you can even choose some necklace and other ornaments that go with the dress. Between soccor practices and playdates, it can be tough to find time to shop for clothing for your growing tots. Luckily, there are plenty of great kids clothing boutiques online. Click here to learn the 10 top websites for finding the best kids clothes. Dressing up your kids in cute, and sometimes highly impractical, outfits is a guilty pleasure that almost all moms share. Sure, your 1-year-old doesn’t need Chuck Taylor high tops that they’ll grow out of in a week, but they’re so cool and cute! But not all of us have the time to go out and shop, especially with energetic and busy kids running around. That’s why online shopping is the go-to nowadays: 79% of Americans shop online. It’s both more convenient and cheaper than going to a mall or a department store. And you can stay in your pajamas the whole time! We’ve got a list of 10 sites with the best kids clothes you can find. We’re going to give you variety: from inexpensive graphic tees to designer labels, you’ll find the perfect site for you and your kids on this list. Zulily has clothes for both adult and kids with options for babies, toddlers, kids, and teens. The interesting thing about this site is that it’s a “flash sale” site. This means that the inventory of clothes is extremely limited and the clothes on the site change daily. It has big brand names along with smaller clothing companies to give you a great variety. Hope on Zulily early to get the pieces you want at great discounted prices and sales. H&M Kids is a great site for keeping your kids rocking the latest trends while staying on a budget. Shoes, jackets, joggers, accessories, jeans, and more can start at 5 dollars or less. They’ll all be modern and stylish and sizes range from newborn to teen. You can also find great cheap themed clothes here: red-white-and-blue bathing suits for the 4th of July, Christmas sweaters, Halloween graphic tees, etc. Uniqlo is a Japanese retailer that specializes in clean and minimalist clothes. This store is perfect for getting all of the basics: plain t-shirts, jackets, and even kid-sized trench coats. They’re especially well known for their puffer jackets that are warm, stylish, and affordable. Kids with Style provides you and your kids with the latest seasonal styles complete with sales and discounts compared to department stores. Their simple and cute clothes will keep your kids stylish and comfortable. Their site also features a “stylist recommendation” section. If you’re never sure what’s on trend or aren’t sure how to style your kids, this can be a great resource to take advantage of. Hear us out on this one. Walmart actually has a lot of cute kids clothes for an extremely low price. It’s especially great for graphic tees, basics, and even underwear and socks. You can get Disney brand clothing for cheap, which is perfect for your Cars or Frozen loving toddler. Walmart also has really fun onesies for the whole family. Pajama party, anyone? Amazon really does have it all. You might not have thought to shop for kids’ clothes on this huge online retailer, but they actually have some great stuff. Not only do they offer Prime free 2-day shipping on many clothing options, they also have a lot of brand name clothes at a discount. They carry clothes for those of all ages from brands you know (Nike, Adidas, Ralph Lauren, etc) alongside other smaller brands. Returns and shipping are easy with Amazon so you don’t have to worry about something not fitting or not liking something. Gap is one of those classic American retailers that is well known for their denim and their slightly preppy style of clothes. You can get some precious kid-size button-ups and chinos for the summertime, or some cardigans and jeans for the fall. They also offer free shipping on orders totaling over $50. You can also return anything you don’t like free of charge. Let’s give you a little bit of a different option here: alexandalexa is the online store to go for designer brand kids’ clothes. Not only do they offer high-end branded clothing, they offer it at a great price. 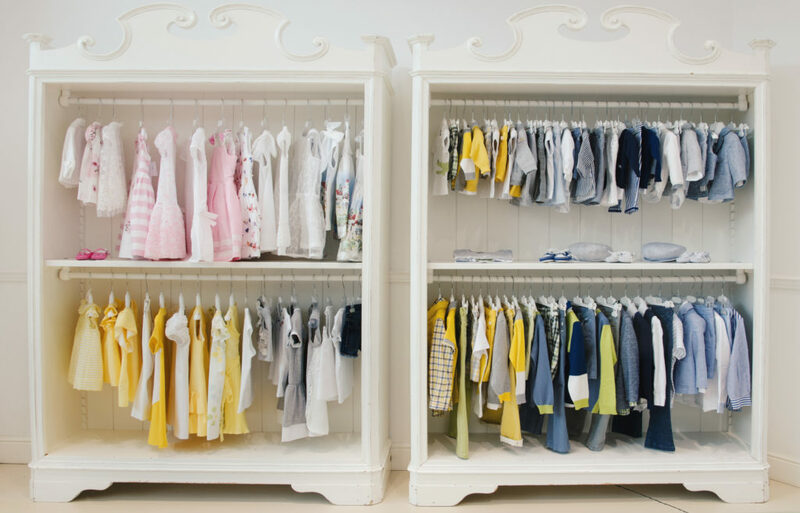 These luxury clothes are both high-quality and fashionable for moms looking to dress their kids in labeled and branded clothes. They offer free shipping on orders over $99, and they have a large and varied sale section. This kids’ brand is an offshoot of the menswear brand Boden. The clothes on Mini Boden are stylish, sleek, and modern. With sizes for kids ranging from 18 months to teens, you’ll have a myriad of options. Mini Boden provides a wide variety of styles, patterns, and colors all while maintaining a polished and sleek silhouette. Mini Boden is also unique in that they understand these are kids’ clothes. They’re stylish and fashionable, but they’re made for kids to feel comfortable in. Kids can play and run around in these clothes without feeling confined or uncomfortable. After going over some higher end options for children’s fashion, let’s return to what we consider an old favorite. Old Navy is well known for their awesome sales and inexpensive flip-flops (1 dollar for polka dot flip flops? Yes, please). The back to school sales both in-store and online are awesome. Deals on kids’ jeans, pants, polos, and t-shirts can save you a ton of cash while maintaining great kid-style. You’ll also find some insane deals specifically on the online store. A lot of kids’ clothes are 50% off with options ranging from baby to teen. They also offer in-store pick-up if you don’t want to pay for shipping costs. Finding the best kids clothes isn’t always easy. Dressing your kids in cool and stylish clothing sometimes means the clothes aren’t the most comfortable. But not all of the comfortable clothes are the most fashionable. The good news is that these 10 sites offer comfortable, stylish, and good-quality clothing for your kids. They’ll be able to run around the playground while still sporting the modern styles you love. Check out our other articles on fashion and clothing to stay up to date with all the modern trends. Finding out you are expecting is one of the most exciting moments in your life, but finding maternity clothes is not. Here are 5 ways to find trendy affordable maternity clothes. The cost of raising a child continues to rise. In 2017, it was estimated that it will cost a middle-income family about $233,000 to raise a child from birth to age seventeen. If you’re pregnant or expecting to be soon, you’re likely focused on plans that will allow you to meet these financial needs. You may be thinking about daycare, diapers, and all that fancy, high-tech baby gear. These things add up. You don’t want the additional worry of where to find trendy affordable maternity clothes. With the focus on fashion bloggers, mommy bloggers, and well-dressed celebrity moms, we understand the desire to look and feel fantastic throughout your pregnancy. Plus, your sense of style is such a personal thing. It’s what helps you feel attractive and confident. Being able to dress the way you want and feel comfortable is especially important during pregnancy. It may sometimes seem like you have no control or insight into your own body. Dressing in a way that makes you feel amazing can make a world of difference in how you feel overall during your pregnancy. Wondering how and where to buy trendy, affordable maternity clothes that will help you maintain your personal sense of style? We understand, and we can help! We want you to be able to focus on other things, like buying adorable outfits for your new baby. So we’ve put together 5 simple tips on where to buy maternity dresses, shirts, and more without breaking the bank. Before you start looking for new clothes, take inventory of what you already have. First asses your dresses. Have body-skimming dresses that you don’t always feel comfortable in? Now is the time to really take advantage of these pieces to show off your beautiful growing bump. You’ll probably find you have at least one looser, flowy dress that can accommodate a growing bump. If you find your dresses are getting too short as the bump grows, you can pair them with leggings if you like that style. Speaking of leggings, you can get a lot of use out of these and yoga pants, especially in your first trimester. Pair with tees and long cardigans – depending on the season – in fun colors for cute, comfortable weekend and errand outfits. Roll down high-waisted leggings and yoga pants as the bump grows to stay cool and comfortable. Remember the tee, legging and cardigan combo, as it can be helpful in dressing yourself post-partum, too. When taking stock of your tops, keep in mind that like dresses, flowy, looser pieces may be worn further into your pregnancy than you may think. Consider layering with camisoles and tanks if necklines feel too low or hemlines feel too high. If you’re pregnant during cooler months, you can take advantage of cardigans, blazers, and other open-style layers throughout your pregnancy. Do you have a sister, cousin, friend, or colleague who was recently pregnant? They may have some maternity style clothing that you can borrow. The great thing about swapping maternity clothes is that you and your friend or sister don’t really have to be the same size in regular clothing. What a taller person wore during their second trimester can work for a shorter woman during the final weeks of her pregnancy. Take what is offered and try items on at different stages in your pregnancy. You may be surprised at what can fit and look great at 6 months pregnant versus 3 months pregnant. If you have a group of girlfriends who are at different stages of pregnancy now, or who may be pregnant at different times over the next few years, consider starting a group inventory of maternity clothing. You can hand off things as they no longer work for you and see what’s available for you to take off someone else’s hands. Keep these clothes within the group so you can all share if some of you experience additional pregnancies over the years. We know that buying clothing from a stranger in your town isn’t the same as buying a dresser you’re going to refurbish, but hear us out on this. Even if a pregnant woman is working with a small collection of clothing throughout her pregnancy, she’s probably taking great care of her items. And because a pregnant woman’s body changes so much and so quickly, nobody is really wearing items so often that they fall apart. Join local mom and mom-to-be groups on Facebook, as well as groups that focus on swapping and buying pre-owned items. Browse daily if you can, so you don’t miss out on great offers. Some women post entire wardrobes of pregnancy clothing in one shot. You can pick up several items at once for an amazing price. You may even be able to snag an item or two from more upscale brands. When it comes to picking up and paying for your goods, remember to be safe. Familiarize yourself with the rules of the group, meet in a public place during the day, and take someone with you. And, if you want to pay it forward, post well-cared-for items back in the sale group once you’re through with them. So, you’ve exhausted all the options that kept you away from the mall and you’re ready to buy some new pieces. We have some great tips to help you stay on budget. Don’t go searching for that perfect body-con dress in a trendy pattern just yet. Remember, items like that may not fit or be comfortable for long enough to be worth the splurge. Start with basic wardrobe staples. Focus on items like solid color tees, blouses, cardigans, and easy dresses. Invest in one or two maternity work slacks or jeans, depending on what your lifestyle requires. Look for shapes and fits that you can wear throughout your pregnancy and even after. Post-baby you can tie loose and bigger tops with cute knots for a better fit. Keep this in mind as you shop. You can even stray from the solid, basic rule if you find a fun shirt you think you’ll wear long after baby, like the trendy graphic tees sold by this company. Once you have your new basics, start experimenting with your outfit choices. Mix, match, and layer. Revisit your options when you have time, so you can avoid the morning panic of feeling you have no idea what to wear that will fit and make you feel good. Repeat pieces as often as needed – we promise only you will notice if you wear the same dress or top twice in one week. Add your favorite accessories for final touches. Silk scarves, statement necklaces, and of course incredible shoes can all make a huge impact on an otherwise plain outfit. Bonus? Your accessories will always fit perfectly. If you’re looking for great basics as mentioned above, there are several stores that offer the high-quality but affordable staple wardrobe pieces you want. Some of our favorites include Old Navy, H&M, and Target. These stores carry a decent range of standard sizes if you want to try stick to clothing that can be worn post-baby, but they also have affordable maternity lines. You can even shop these stores online. If shopping online is your thing, there are other fun options for you, too. The market for online maternity shopping is growing, and online retailers are striving to meet the demand for trendy, yet inexpensive maternity clothes. Zulily is an example of an online discount site with deals on fashionable maternity clothes. Asos is another fashion-forward online retailer with an impressive maternity selection. Sign up for emails from retailers like these and be the first to know about special sales and coupon offers. These retailers are especially popular among moms-to-be who are looking for dresses for their maternity photo shoot, baby shower, or a special event like a wedding. Don’t forget about your favorite discount department stores, either. Retailers like TJ Maxx, Ross, Kohl’s, and Marshall’s typically have a small selection of maternity clothes. These are great places to go for fashion-forward pieces and steals on higher-end brand names. Feeling comfortable in your clothing and in your body during your pregnancy is just the start. In addition to finding trendy affordable maternity clothes, there are other things you can do to make your pregnancy and motherhood as enjoyable as possible. Luckily, we are here to help with a wealth of valuable tips and advice. Browse our blog for insightful articles on everything from food and wellness to education and travel. Whether you’re looking for the best way to clean your kitchen in between soccer practices and work, or you’re on the hunt for kid-friendly recipes, you can find it here. Pregnancy and parenting can be tough. We hope to help you find balance and joy in all the wonderful chaos. When your little girl is getting married you’ll want to be ready to play your part in the wedding planning and the big day without overstepping your boundaries. Here’s how to fulfill your Mother of the Bride duties like a rock star. Your daughter has just told you that she is marrying the man of her dreams. What an exciting time for her and you! When your little girl is getting married, you’ll want to be ready to play your part in the wedding planning and the big day without overstepping your boundaries. Here’s how you can fulfill your mother of the bride duties like a rock star. When the bride and groom decide on a city, help them scout locations. This will be especially helpful to them if they are living out of town from the actual destination. You can also help them with getting hotel room blocks together for out of town guests. Often times, people want to bombard the bride with questions that someone else can easily answer. As the mother of the bride, take some pressure off your daughter and offer to be the go-to contact person for vendors and the wedding party. You can get with your daughter so you have all the details of things she wants and expects so you can answer any questions and give her a break to focus on other things. Helping the bride choose flowers is a great task for mother of the bride. Ultimately, it’s her decision, but she may need your input on what flowers will be best depending on the time of year of the wedding. Finding the right flowers is a big deal for any bride. It’s tradition for mom to go with her daughter to try on wedding dresses. You can also help her decide on the style and colors for her bridesmaid dresses. You can check out Baby’s Breath Bridesmaids to find the right style and color for each woman. Another task you can check off your mother of the bride checklist is helping with the bridal shower. Traditionally, parents of the bride don’t host the shower, however, you may choose to do so and that’s totally fine. If someone else hosts, you can offer to help with food or setting up. While this is an exciting time in her life, your daughter may also feel stressed and overwhelmed. Be the supportive ear that she needs. Remind her how special she is. On the big day, tell her that she is the most beautiful bride. Be a shoulder to cry on and someone to vent to. The most important of all the mother of the bride duties is to enjoy the experience. Sharing in your daughter’s special day will be a memory neither of you will ever forget. The role of mother of the bride is a wonderful one that you will cherish. Be sure to check out our blog for other ideas for all stages of motherhood and contact us with any topics you have questions about.